We ship it world wide. The shipping cost is $14.95 no matter where you are. You may be able to find some online store selling it for a few dollars cheaper, but all of those stores are based in Shenzhen, China. It would cost your $40~$60 to ship your tablet back to them if you need replacement or repair, while uPlay Tablet is Ainol’s distributor in North America, our office and customer service are in Silicon Valley, California, your return and repair are handled in California as well. Update on May 31, 2012. 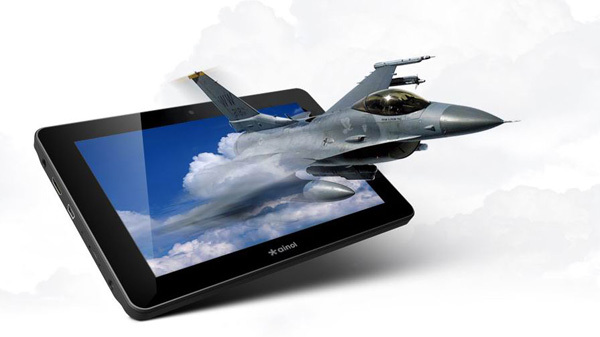 Ainol has released its first Dual-Core ARM Cortex-9 CPU based 7″ tablet – NOVO 7 ELF II. Ainol NOVO 7 ELF II also come out with an English version . 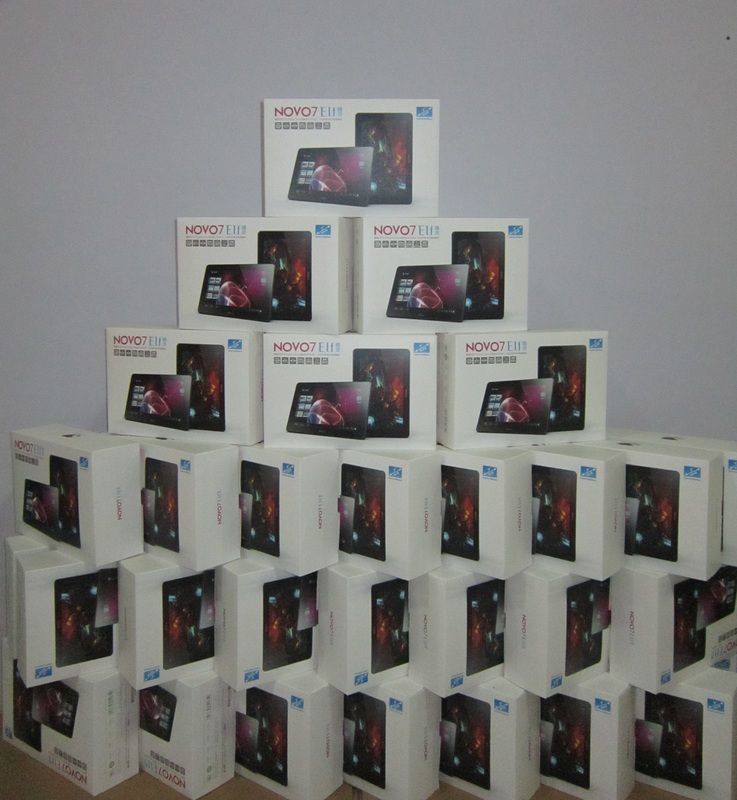 As Ainol’s oversea distributor , uPlay Tablet will be selling this English Edition of NOVO 7 ELF II in a week. Customers who want to buy the new Ainol NOVO 7 ELF II can pre-order it by clicking the “Buy Now” button on this page. We will ship the order strictly according to the order we received. Update on May 8, 2012. The release date of Ainol’s new model of NOVO 7 ELF, aka ELF II, is pushed out to end of June or beginning of July. In order to meet the customer demand on Aurora , the Aurora production has resumed, and English version will be ready to ship in the week of May 14. We are taking pre-order of English version of Aurora now. For customers who pre-ordered ELF or ELF II from us but not shipped, we also offer three options: 1). Pay extra $20 to upgrade to the English version of Aurora (black color) that we are going to ship next week. 2). keep the order, get free upgrade to the new ELF II when they are released in beginning of July. 3). Cancel the order and get full refund. We will email all of customers placed pre-order today and tomorrow, so make sure you check your emails and let us know your choice. For details check this news. If you don’t want to wait, we recommend you buy another quality tablet from the other Chinese tablet company that we are representing, woPad A10 . It’s basically the same hardware and from the same reference design as Aurora except the screen, woPad A10 has a 800×480 capacitive screen and a high-end looking real metal case like iPad , but it is only $119.99, the cheapest one among all Android 4 .0 tablets running AllWinner A10 CPU. Buy woPad A10 from our store. Update on April 9: The new release of ELF (aka ELF II ) will be end of this month or beginning of May. Ainol has upgraded ELF with a due-core CPU from AmLogic . The price is not finalized yet, but mostly likely will be $10 to $20 higher than the old model. We are taking pre-order now, and will honor the current price for all pre-orders. You can pre-order it by clicking the “Buy Now” button on this page. We will ship our ELF II strictly according to the order we received. The supply of ELF II at the beginning will be limited; therefore, we recommend our customers to place the pre-order now in order to secure their priority. Update on March 8: Ainol has released firmware upgrade for Google Android 4 .0.3 on March 8. It now has Android Market and fully supports FLASH. uPlay Tablet also preset the language and input into English for you. Update on April 6: Out of stock now. You can pre-order to get your order in the queue, but Ainol hasn’t disclosed the exact date of next release. If you don’t want to wait, we recommend you buy another quality tablet from the other Chinese tablet company that we are representing, woPad A10 . 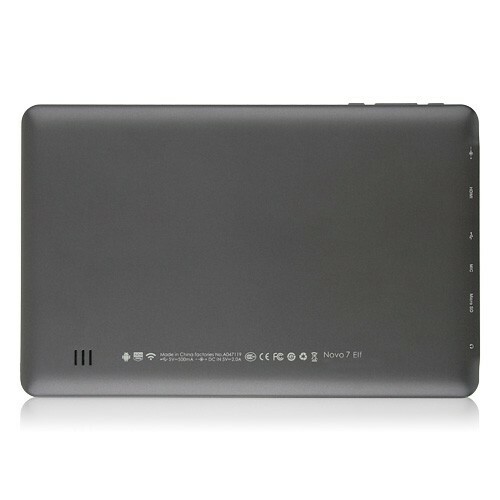 It’s basically the same hardware and from the same reference design as ELF except the screen, woPad A10 has a 800×480 capacitive screen and a high-end looking real metal case like iPad , but it is only $119.99, the cheapest one among all Android 4 .0 tablets running AllWinner A10 CPU. Buy woPad A10 from our store. 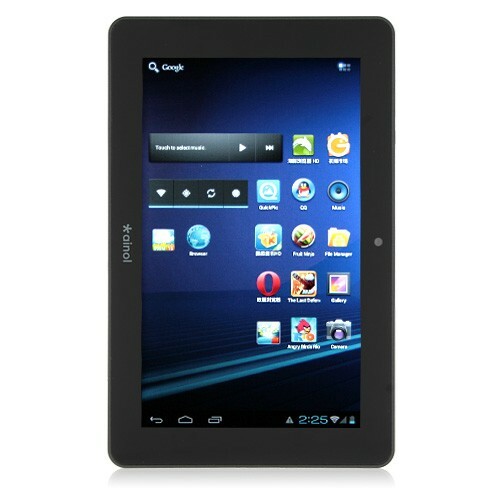 ONLY $149.99 from uPlayTablet. The Ainol Novo 7 Elf Edition has an ultra powerful All winner Many CORE A10 1.2GHz (ARM Based, not MIPS based). The Ainol Novo 7 ELF runs the latest Google Android 4.0.3 Ice Cream Sandwich operating system (one of the first Google Authorized tablet running Android 4.0 ICS), features a multi-touch 7-inch high resolution 1024 x 600 display, plays 4X full HD video, and has a front facing 2 mega pixel camera for taking picture, shooting video, and video conferencing. Ainol NOVO 7 ELF was released by our partner Ainol on January 14, 2012, just before Chinese New Year. It’s the replacement of the the fairly popular Novo 7 Advanced Editions. Ainol NOVO 7 ELF has an ultra powerful Many Core A10 1.2Ghz CPU, the type of CPU that is typically found in 9.7″ Capacitive tablets . 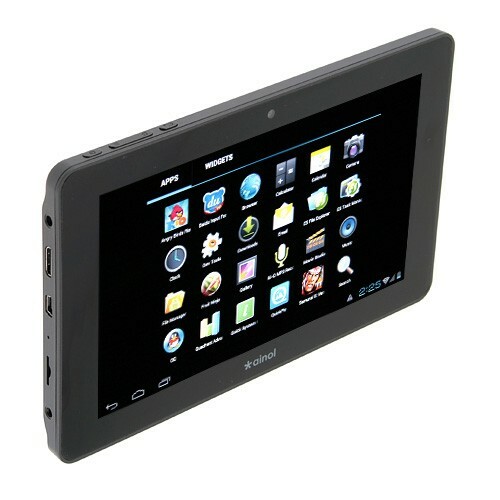 The NOVO ELF Edition runs Android 4.0.3 Ice Cream Sandwich operating system, features a multi-touch 7-inch high resolution 1024 x 600 display, adopts the Many CORE A10 1.2GHz A10 processor, a Mali-400 GPU. Ainol NOVO 7 ELF tablet also features a 2.0MP front camera (something that the NOVO 7 Paladin does not have), and supports 2160p Super HD video playback. With the 3G (with external dongle) and Wi-Fi connection, you can browsing the web anywhere and anytime. 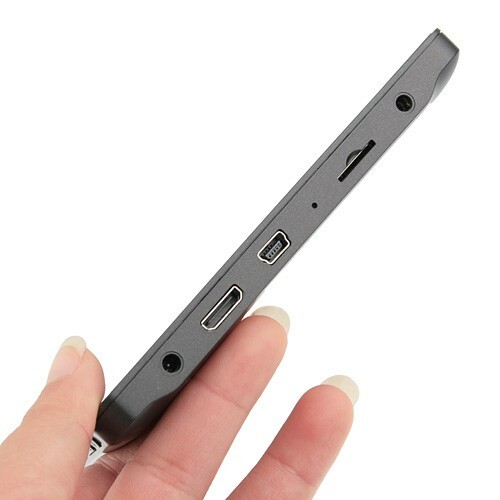 Ainol NOVO 7 ELF also has other functions, such as HDMI output, OTG Function, E-book reader, audio and video playback and so on. 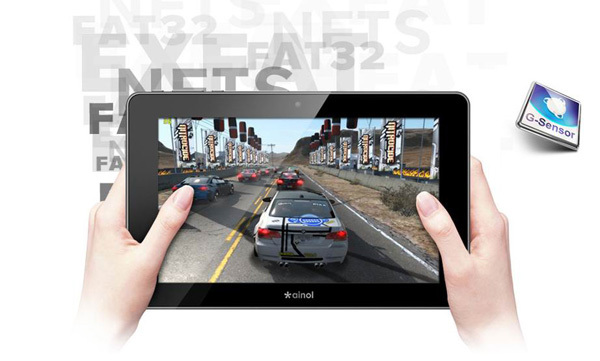 Ainol NOVO 7 ELF Android 4.0.3 tablet is powered by 3700 mAh battery for longer battery life (Music 25 hours, Games 6 hours, Web 7 hours, video 8 hours). 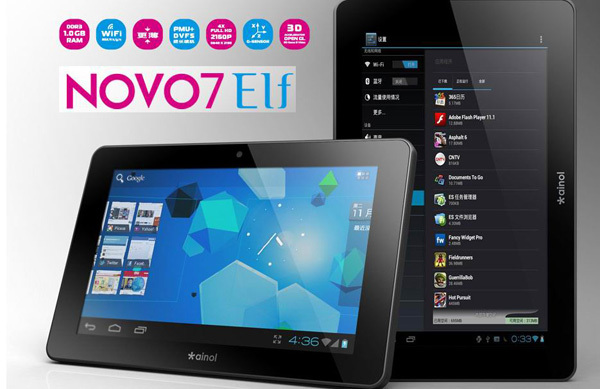 NOVO7 ELF is one of the first Android 4.0 tablets authorized by Google. The all new designed Google Android 4.0 has kept many good features in 3.X systems, and improved the GUI with better layout, more intuitive, more smooth transition, and virtualized all keys. You can even merge the file folders like in iOS, switch between multi-tasks, plus all new widget tools. Ainol NOVO 7 ELF is running the renowned ARM Cortex-A8 based many-core AllWinner A10 and Mali 400 GPU. AllWinner A10 has smart mutli-task management, which enables superior performance for 3D games, Super HD video, and web surfing, while maintains low power for long battery life. In the latest March 8, 2012 firmware release, the Google Market ( Google Play ) is added. You can access and download more than 400,000 apps directly from your tablet. In the latest March 8, 2012 firmware release, the support to FLASH is added, the latest version (v11.1) of FLASH player is pre-installed. You can watch YouTube and other flash-based Internet video sites directly in the browser. Ainol NOVO 7 ELF supports 2160p super HD, and all 1080P HD and other HD formats in more than 20 file formats, such as MKV, AVI, RM, FLV, WMV. Ainol NOVO 7 ELF automatically recognizes HD TV connection, and outputs video signal to TV. It displays on both tablet and TV for all operations. When HD video is playing, the tablet screen will be off. Ainol NOVO 7 ELF has 5-Point Mult-touch plus ALPS touch buttons, 1024×600 pixel high resolution, 7 inch IPS 150 degree angle display, gives you excellent performance for playing games and watching videos. Ainol NOVO 7 ELF supports WiFi standard 802.1 b/g/n, and also supports external 3G dongles (see supported 3G dongle list at the end for more details). Enclosure – The case for the Ainol NOVO 7 ELF has been redesigned to make it thinner. 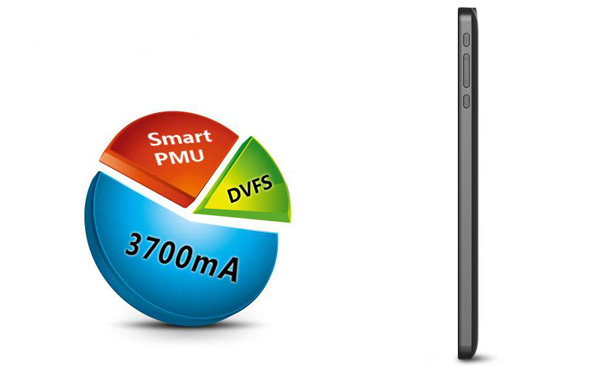 DVFS and Smart MPU dynamically adjust the power, plus the big 3700 mAh battery, you can enjoy 7 hour non-stop web surfing time and super long the standby time. 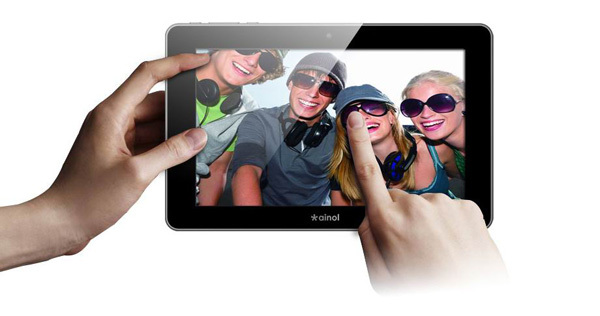 The built-in HD front facing webcam on Ainol NOVO 7 ELF supports photo, video shooting, and teleconference. Ainol NOVO 7 ELF supports EXFAT, NTFS, FAT32, and multi-partionned disk drives, so you can play video files larger than 4GB. Ainol NOVO 7 ELF has built-in 3 axis gravity sensor, super sensitive. Ainol NOVO 7 ELF is more than capable of handling Android 4.0 perfectly, and in our opinion the Ainol Novo 7 ELF is the most unrivaled value for money tablet on the current market and will be for a long period of time to come. Camera: Yes, 2.0MP Front Camera. Flash: No, support HTML 5 . Language: Indonesia, Dansk, Deutsch, Chinese, English, Spanish, Germany, Italian, French, Latvia, Malay, Nederlands, Poland, Romania, Russian, Greek etc. Optimized the firmware, improved the GPU and memory performance. 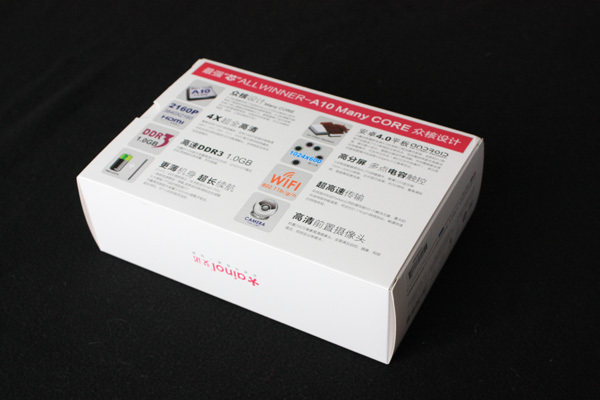 Ainol NOVO 7 Aurora and NOVO 7 ELF have similar packaging box, but the inner box is designed in different styles. 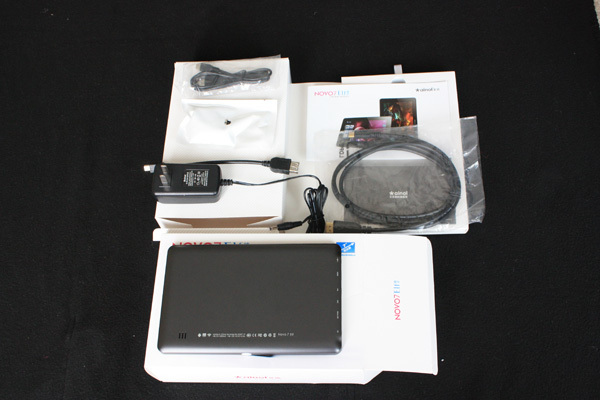 Both have a separated box for the tablet itself, but NOVO 7 Aurora’s dedicated tablet box is detached from the accessory box. 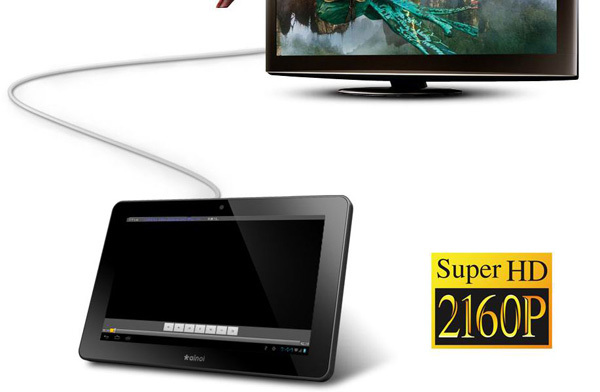 A HDMI cable is included as a bonus, so you don’t have to buy cable to connect your tablet to your HD TV. 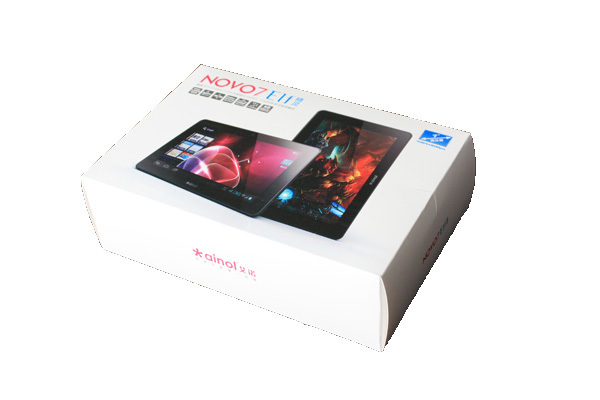 NOVO 7 ELF is a Chinese brand tablet PC, there is some Chinese games or 3th party apps pre-installed. If you don’t like them, you can go to setting-manage application to remove it. We do change the language and input method to English, and install Android Market on ELF. You can add $20 to buy NOVO 7 Aurora with IPS screen . For more detailed comparison of NOVO 7 Aurora and ELF, check out our “Ainol NOVO 7 Aurora and NOVO 7 ELF Comparison Review”. We have WHITE version in stock , and we ship it world wide. The shipping cost is $14.95 no matter where you are. If you want your item to be delivered in US within 3~5 business days, you can do so by purchasing the additional express shipping ($9.95 per item) once you place your order. We will ship it by FedEx, DHL, or UPS. Check out our Ainol NOVO 7 ELF support forum. Have a question about this tablet? ask your question here. You will get answer by email. If you don’t want to wait, we recommend you buy another quality tablet from the other Chinese tablet company that we are representing, woPad A10. It’s basically the same hardware and from the same reference design as Aurora except the screen, woPad A10 has a 800×480 capacitive screen and a high-end looking real metal case like iPad , but it is only $119.99, the cheapest one among all Android 4.0 tablets running AllWinner A10 CPU. Buy woPad A10 from our store.